It all started last week when I saw this pretty dribbble shot. I immediately felt the urge to convert it into a working clock and share it with Tutorialzine's readers. If you'd like to learn how I made it, read on! Update: The second part of this tutorial is now live! There we are adding support for setting alarms with HTML5 audio. Read it here. All segments are visible, except for the middle one (otherwise it would be an 8). I have added a CSS3 transition property to all these spans, which animates the opacity when switching between numbers. There is a lot of other CSS in the stylesheet, but I will not be presenting it here. I believe the best way to learn how the CSS works is by inspecting the live-working code of the demo in Firebug, Chrome's Inspector or the developer tools of your browser of choice. With this our digital clock is ready! Check the next part, where we adding support for setting alarms and playing them back with HTML5 audio. Good Job! Thank for your sharing! I like this! Incredible. Dont know how you do this, but EVERYTHING you post here is brilliance and quality,, Martin. Thx for all of your work, man! Awesome script, one of the most impressive things I have seen in a while. Looks really good. This is incredible, but why did you decide to create separate elements for each part of the digit rather than just having ten different vector files for each digit? I took it as a challenge. Having each segment of the digits as separate elements opens the doors to interesting CSS3 transformations when switching from one digit to the next. You could use 3D transforms and rotations, color changes, opacity for each part individually, which would be impossible with images. To be fair the easiest way would probably be to simply use or make a web font and include that in the page. Great thanks Martin, this is the best tutorial site I've seen ever. Awesome Martin, much appreciate your work. Always comes to your blog whenever i need to learn something new. Hello, can set this clock to work with diferents times, example, can i display the time of New York, the time in london, or california? Thanks. This is very cool! Great work. Very cool stuff! Can we have similar post on AngularJS? a small comparison between the two[AngularJS and jQuery] would be even better. 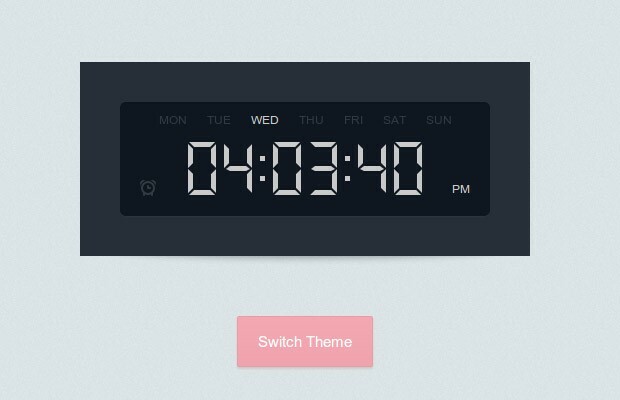 Great tutorial and awesome clock! Thank you very much! Awesome Martin today i came first time in your blog and i am very happy to read it's. And your work is totally unique.Thank you so much for sharing your ideas. This is really nice. I liked it so much I decided to extend it to have a smaller version that fit into the space I had on a few pages.